The Federation of Children's Book Groups is co-ordinating a range of events to celebrate the second National Non-Fiction Day, a day dedicated to the celebration of the best information and narrative non-fiction books for children. The scheme has been launched in association with Scholastic, publisher of the Horrible Histories™. The aim of National Non-Fiction Day is to dispel the myth that non fiction belongs solely to the confines of the classroom. Non-fiction can inspire as well as educate, deliver humour along with hard facts, and can often rival the best fiction for excitement and intrigue. National Non-Fiction Day is an opportunity to inspire teachers and librarians, children and parents, to have fun whilst learning about the world we live in. The focus this year is on sharing information. 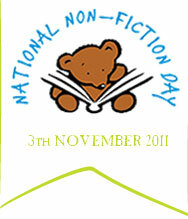 The day itself will be covered by a number of bloggers whose sites will be dedicated to Non-Fiction for the day. Novelist and former SAS operative Andy NcNab thrilled workers at McVitie's Manchester when he visited them (Monday 31st October) to sign copies of his new book Dead Centre, and celebrate their Learn 4 U Centre's success in winning the prize draw for workplaces participating in the Six Book Challenge. Launched in 2008 by independent charity The Reading Agency, the annual Six Book Challenge encourages less confident readers to develop a new reading habit and improve their skills at the same time. Participants are invited to pick six reads of their choice and complete a reading diary in order to receive incentives along the way and a certificate. Following his visit, Andy said: "Reading and literacy changed my life. So it is wonderful to see partnerships such as the one at McVitie's working so successfully to promote and encourage reading through programmes like the Six Book Challenge." 'Andy McNab' is the pseudonym of a former Special Air Service (SAS) operative and soldier. He first came to public prominence with Bravo Two Zero, his account of the failed SAS patrol for which he was awarded the Distinguished Conduct Medal in 1991, to add to medals he had won previously in action, becoming the British Army's most highly decorated serving soldier when he finally left the SAS in February 1993. Dead Centre is his latest thriller in the bestselling Nick Stone series. 18,000 young people and adults across the UK registered for the Six Book Challenge this year through libraries, colleges, adult education, prisons and workplaces with potentially life-changing results. The main activity for the Six Book Challenge 2012 will run from January to September, but organisations are welcome to run it at any time that suits them during the year. Help support the work of IBBY UK by purchasing a special Christmas card featuring Shirley Hughes' timeless illustration from Out and About Through the Year (Walker Books) which she has kindly donated. Cards are 105 x 150mm and are available in packs of 10 @ £6 each pack (incl. postage and packaging). The text inside reads "Happy Christmas". Chapter One of Root, new interactive serialised story, created by Random House Children's Books and the readers of the Guardian teen site, was published yesterday. Root is a fast-paced thriller set in the shadowy world of computer hacking and espionage. There will be a new installment every weekday for the next six weeks. Macmillan Children's Books has acquired a new trilogy called Birthright by Elsewhere author Gabrielle Zevin, who was previously published by Bloomsbury. UK and Commonwealth rights, excluding Canada, were bought in the books from Douglas Stewart at Sterling Lord Literistic agency in the US, in a deal brokered by the UK sub-agent, Shirley Stewart of the Shirley Stewart Literary Agency. we turned to the Associate Books Editor, who has three younger sisters: Isabel (7), Olivia (6) and Sofia (4). Who better to give expert opinions on this fall's hottest children's books? Amazon Kindle Fire Format 8 Targets Children! The Kindle Fire will come equipped with a specific Children's Books selection and a layout system so kids can design their own backgrounds. "I feel sorry for young illustrators who are thrown right in at the deep end," [Anthony Browne] reflects over tea at Tate Britain. "Not only have they got to sell immediately, they've got to go out and perform." I'm now reading Alice Oswald's poems, 'Memorial', which is extraordinary, and John Lanchester's 'Capital', which is absolutely my kind of book: a big London novel with a big cast of characters. An author mistakenly nominated for the National Book Awards in the US but who was allowed to stay on the shortlist has now been asked to withdraw. Children's author Lauren Myracle's book Shine appeared on the shortlist last week for young people's literature. But the book was withdrawn after the National Book Foundation cited a "miscommunication" with the judges. Shortly after, the Foundation welcomed Shine back into the category. But by Friday, Myracle was asked to withdraw. The Mythic Coast project is part of the regeneration of Wyre's waterfronts. The project was made possible by a cash injection from the Government's Sea Change programme, which recognises schemes that have the potential to regenerate seaside towns through cultural and environmental enhancements. Match funding came through contributions from Wyre Borough Council and the support of the Lofthouse family, makers of the world-famous Fisherman's Friend, manufactured in Fleetwood. The Sea Swallow story was written by children's author Gareth Thompson. His story brings together the project's aims: to reference landmarks across the Wyre; be appropriate for staging or outdoor performance; have contributions from the local community; include educational and geographical reference points; be adaptable for website and other multi-media follow-ups and open up themes for large-scale sculpture and public artworks. The Sea Swallow is his fourth book. His previous novels, published by Random House, were young adult novels. The book is illustrated by Wyre Way Mythic Coastline competition winner Hannah Megee. Hannah beat off stiff competition from over 100 artists in the nationwide search for the right illustrator to convey the The Sea Swallow's themes in captivating imagery. Hannah's designs also provide the inspiration for the Mythic Coast artworks which will be created by artist Stephen Broadbent. Stephen designed the award winning Cleveleys' 'People's Promenade', a new public space that serves as a tourist attraction with sea defence works that will protect 2700 houses and 219 businesses in Cleveleys from tidal flooding. Stephen will create a sculpture trail, telling The Sea Swallow story, that visitors can touch and play with. The first sculptures will be unveiled on Cleveleys promenade this Autumn [2011[, with more sculptures to come, up and down Wyre's waterfront. 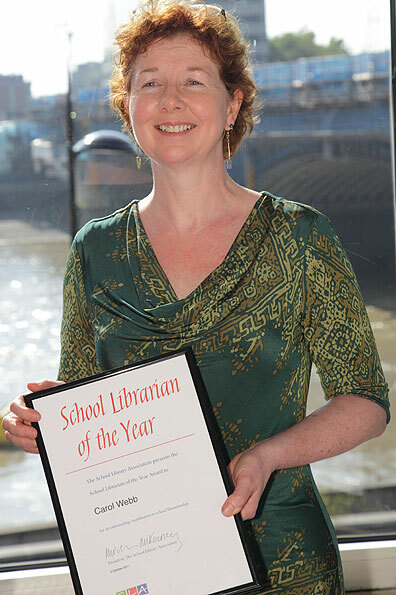 In July 2011, copies of The Sea Swallow were given to 4,200 Wyre schoolchildren aged 7 - 11. The two authors have been doing collaborative work in children's literature and varied presentations for kids of different age groups in different countries for the past 23 years. Both being former teachers, they, however, chose to outgrow the classroom and emerge as self-styled missionaries with a common goal of inculcating the reading habit among kids in a high-tech world where books are being replaced by a whole lot of gadgets. They just want kids to nurture and carry forward the habit of reading books rather than accessing information with the click of a mouse. "We write so children can read," says Barlow while Skidmore backs it up with an alarming statistic when he tells us that the average home in the UK has less than 10 books. "There are no books for children to read. Language is getting shorter, there are a lot more things to do than read and with the wide use of iPads and tablets, books are getting rarer," says Skidmore. In that light, the two Steves take it as a personal challenge to help increase literacy and reading levels in the country. This is an exclusive chance to find out about Jacqueline Wilson, in the first ever exhibition dedicated to the best selling author. Let Jacqueline guide you through a journey of her favourite stories, characters, daydreams and working process. We'll show you how your favourite characters began including Tracy Beaker, Hetty Feather and The Illustrated Mum, from ideas to text and working with illustrator Nick Sharratt to bring her stories to life. Be inspired to create your own stories, sit and daydream or join Jacky's HUGE fan base from all over the world. 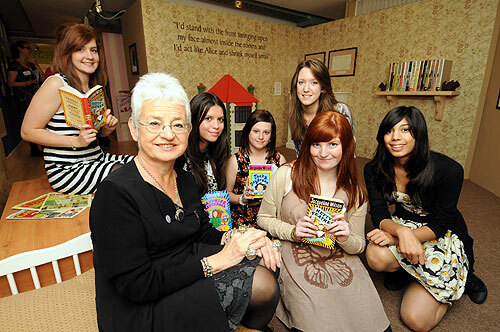 Jacqueline Wilson with 10 young people from the North East who took part in a creative writing project at Seven Stories. 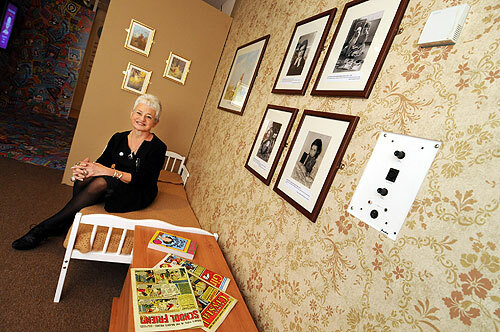 Jacqueline Wilson relaxes in a replication of her 1950's bedroom. 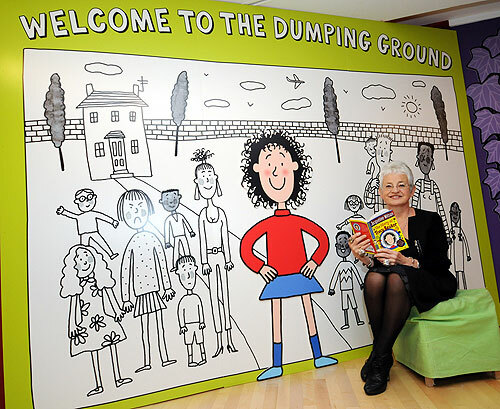 Jacqueline Wilson and Nick Sharratt meet their fans in the set of Tracy Beaker at Seven Stories. The Bath Festival of Children's Literature hosts Jeff Kinney, the American author of the hugely popular book, and film, Diary of a Wimpy Kid, in a one-off, special event at the Pavilion in Bath on 3 December 2011 at 2pm. To celebrate the launch of his new book, Diary of a Wimpy Kid: Cabin Fever, Jeff will be revealing his top secrets to becoming a best selling author, his inspiration behind the series, and audience members will get the chance to see his very first written concepts and drawings of Wimpy Kid. This event will be the best chance to find out how Jeff creates the jokes for the books and how the characters made the transition from page to screen! A thorough Q&A session will follow the event for all those with a burning question. The Diary of a Wimpy Kid series chronicles the adventures of wise-cracking pre-teen Greg Heffley who must somehow survive the scariest time of anyone's life, middle school. Aided by best friend Rowley, Greg must put up with a highly dysfunctional family as he embarks on a journey of survival. Written in journal style and filled with hand written notes and simple drawings of Greg's daily adventures, Jeff Kinney's books have been hugely popular the world over. despite having the word book in their names, this collection of Kindle Fire formatted children's books are as much apps as they are books. If that assumption is correct, then the "appification" of 1,000-books (or 1,000 apps) of children's book/apps before the Kindle Fire launch next month appears to be heavily subsidized by Amazon. Book publishers, especially the long-tail of small-house children's book publishers, are already strapped keeping up with two formats (iOS and Kindle) to support yet another format, the Kindle Fire version of Android (which, like iOS apps, must be approved by Amazon before making it onto the Kindle Fire). However, as always, some creative entrepreneurs started thinking about books as software long ago. The Kindle Fire could be their overnight success that took ten years to happen. For example, the decade-old company, zuuka, publishes iStory Time apps for the iPad via iTunes and will have Fire formatted books on day one. Forty-five home experiments to engage budding physicists, published in association with the Institute of Physics. It's a well-designed little title, with a plainspeak text introduction on the left-page with comic strip visuals and speech-bubble guidance on the right. Caitlin Watson is Physics in Society Manager for the Institute of Physics and she has been working in science communication for over twelve years. Victoria Le Billon lives in Bristol and divides her time between working as a Graphic Designer, an Illustrator and a mum. Orchard Books has announced the acquisition of Me, the Queen and Christopher, a charming, laugh-cry, poignant children's books for 5+, from the bestselling author Giles Andreae, illustrated by the popular Tony Ross. The deal for world rights was brokered with Jodie Marsh, United Agents(for Giles Andreae) and directly with Tony Ross. "I'm immensely proud to have written this book. I feel it's extremely important that it is getting published because it shines a light on a very delicate subject with real warmth, heart, joy and above all humour." Giles is an award-winning and bestselling author, and creator of Purple Ronnie and Edward Monkton. He is the author of Giraffes Can't Dance, a Richard and Judy pick, with1.5 million copies sold across the range, and many other popular picture books. Megan Larkin, Publishing Director, Orchard Books, adds: "I can never resist a book that makes you laugh and makes you cry, and it's a dream come true when it's written by one of our best-loved authors. This book is quite different to what Giles is known for, and we're hugely excited to be publishing this very special story that comes from the heart - and is tremendous fun." Fifty years of "The Phantom Tollbooth." This has picked up lots of favourable reviews since the hardback appeared earlier in the year. What I loved about A Year Without Autumn was how it manages to wrap up so many ideas and threads into one short novel: How the smallest things can change our lives forever; how tragedies can erode not just the lives of those directly affected, but send damaging ripples out to those nearby; how we can become brave by necessity; how it's never too late for second chances; how important friendship is. From the moment twelve-year-old Jenni is flung forward in time, you'll find it impossible to put down - what begins as a beguiling tale of two, quite different, girls' friendship turns into a page-turning thriller and you'll be racing alongside Jenni as she tries to understand all the changes that have happened in one short year and figure out a way to make things better. And what's so well done is that you'll really care - all the characters are incredibly three-dimensional, both adult and child, and there's also a great subplot which picks up the theme of how one small decision can alter a life forever. I particularly enjoyed how circumstances force the timid Jenni - who is happy to bask in the reflected light of her extrovert best friend Autumn - to take charge and come out of her shell. The book is also structured very cleverly, which adds to the suspense, and although there is a lightness of touch throughout, there are several serious themes touched on that will give readers much food for thought. Sophie McKenzie Interview at Liberton High School from Scottish Book Trust on Vimeo. It's tough to combine being a mum with running your own business, but Kate Wilson, originally from Edinburgh and working in Southwark in London, has done it so well that her success has been recognised at the 2011 Mumpreneur Conference and Awards sponsored by Yell and DHL Express. Kate Wilson's new children's book and app publishing business, Nosy Crow, which launched in January 2011, was chosen by a panel of independent judges that included Dragons Den star Duncan Bannatyne- who says anyone running their own business 'must stay focused and work hard'- as the winner of the Most Inspirational Business Mum Award. "This is the most fantastic - and unexpected - validation of the hard work of the clever and professional staff of Nosy Crow and of our creative and professional authors and illustrators. I am so grateful to them, and to our customers throughout the world, from independent bookshops just a few minutes down the road to Apple in Cupertino, California, whose support of the books and apps we are publishing has made our first few months of publishing such a success. And, of course, I am grateful to Mumpreneur UK, Yell, DHL and Intuit for making the awards happen, and to my children and my husband for their support every day. Anyone setting up a business, a social enterprise or a charity, particularly in the current economic climate, is courageous. To do so while having young - or youngish, in my case! - children takes even more bravery. I think all the parents shortlisted for the awards are inspirational, but I am very proud and happy that we were singled out." Nosy Crow is a new, independent company, publishing children's books and apps, including high-quality, commercial fiction and non-fiction books for children aged from 0 to 14 from both well-known authors and illustrators and new talent. The company also develops innovative, multimedia, highly interactive apps for tablets, smart phones and other touchscreen devices. These apps are not existing books squashed into phones, but instead are specially created to take advantage of the devices to tell stories and provide information to children in new and engaging ways. Kate was chosen from 720 entries into the awards and is the third Inspirational Business Mum to be announced by Mumpreneur UK. Laura Rigney, co-founder of the organisation said "Both the judges and the Mumpreneur UK team were blown away by Kate's story and couldn't think of a better example of a successful business mum. In such a short period of time Kate and her team have built a brand that will soon be recognised and trusted worldwide." 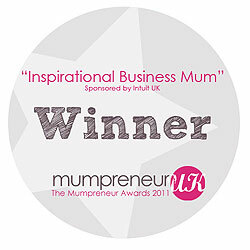 For more information on The Mumpreneur Awards 2011 award winners, visit www.mumpreneuruk.com, where you can also find support, resources and other events for mumpreneurs in the UK. At a celebration at the Mermaid Conference Centre in London on 3rd October 2011, Philip Reeve, author of many award-winning children's books including the 2007 Carnegie Medal winner Here Lies Arthur, presented the honour of School Librarian of the Year 2011 to Carol Webb, Librarian at Forest Hill School, London. The Canadian national section of the International Board on Books for Young People (IBBY) is pleased to announce that Andrea Deakin and Chantal Vaillancourt are the recipients of the 2010 Claude Aubry Award for distinguished service in the field of children's literature. Andrea Deakin will be presented with her Aubry Award in Edmonton on Thursday October 27th from 4:30-6:30 p.m. at the Bruce Peel Special Collections Library (Lower Level, Rutherford Library, University of Alberta). Chantal Vaillancourt will receive her Aubry Award at the Museum of Fine Arts in Montreal on Tuesday, October 25th at 7.00p.m., in conjunction with the gala presentation of the French language TD Canadian Children's Literature Award. Andrea Deakin has promoted Canadian children's literature extensively throughout her career as a teacher, syndicated book reviewer, and correspondent for the UK review journal ACHUKA. In 2004 she was awarded an honourary doctorate from Okanagan University College. An online newsletter Andrea started in 2004 is now being published by the University of Alberta as an ejournal, The Deakin Review of Children's Literature. Andrea also curated and donated a collection of award-winning children's books to the library at Okanagan College in memory of her husband. A long-time resident of Salmon Arm, British Columbia, Andrea now lives in Edmonton. Chantal Vaillancourt has worked for over 20 years in publishing and reading promotion. She was formerly executive director of Communication Jeunesse, and helped to create the Toup'tilitou reading program in daycare centres across Quebec. Since 2006, Chantal has been a consultant, including working with the Canadian Children's Book Centre as coordinator of the French-language TD Canadian Children's Literature Award, and managing the French-language component of TD Children's Book Week. She is actively involved in the TD National Reading Summits. Chantal lives in Longueuil, Quebec. The Claude Aubry Award was established in 1981 in honour of the late Claude Aubry of the Ottawa Public Library. Two awards are now presented biennially by IBBY Canada for distinguished service in children's literature in English, and in French. Previous recipients include David Jenkinson, Charlotte Guerette, Peter Carver, Catherine Mitchell, Bertrand Gauthier, Michael Solomon, Ron Jobe, Virginia Davis, Judy Sarick, May Cutler and Sheila Egoff. The winner will be announced at an event at Kings Place in London on Thursday 10 November. This year's judges are Michelle Paver, Julia Golding and Marcus Sedgwick. with Julia Eccleshare as chair.